Bing Advertising On Google For Car Insurance? Home > Google News > Google AdWords > Bing Ad On Google AdWords For Car Insurance. Why? 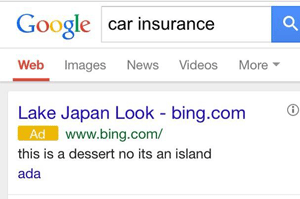 Bing Ad On Google AdWords For Car Insurance. Why? Matt Burgess posted a picture on Twitter of an ad he spotted on his iPhone when searching Google for [car insurance]. It was an ad from Bing. How weird. Why would Bing advertise on Google for such an expensive keyword, to send the traffic to bing.com? Arbitrage? I doubt it. The ad text doesn't make sense either. Lake Japan Look as the title and a description with "this is a dessert no its an island." It doesn't make much sense. It could have been a mistake by Google AdWords ad platform or it could have been a weird test by Bing's advertising team? I am not sure. I was not able to replicate it but it does look legit. Was it someone outside of Bing or inside of Bing is unknown.